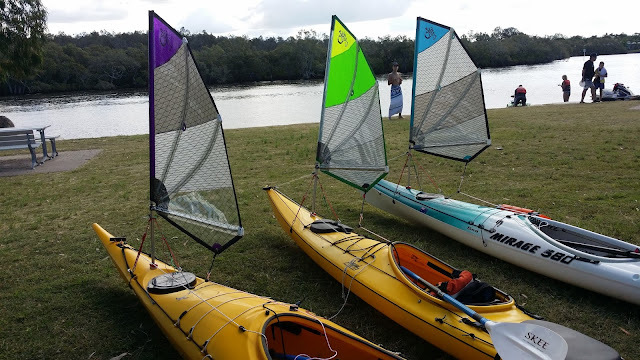 The following sails are in stock and available for immediate delivery. They are all available with or without reefing eyelets. 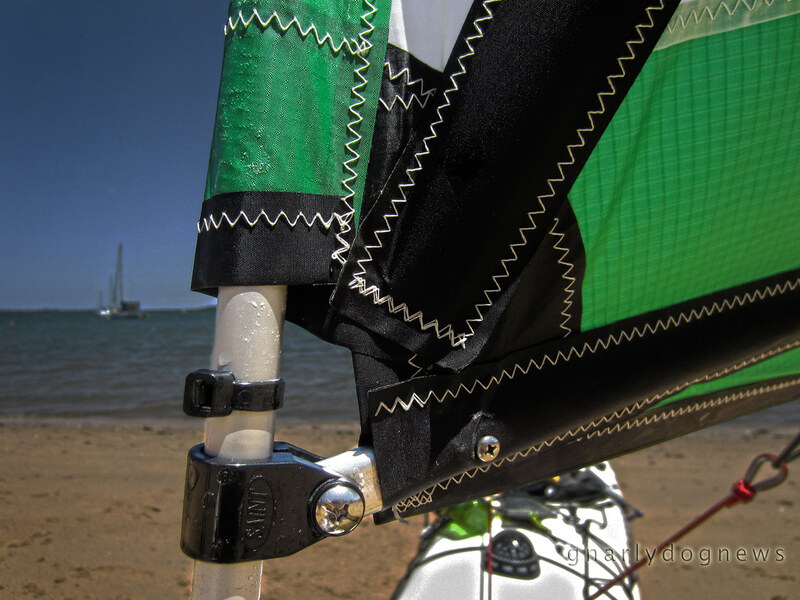 Reefing option reduces area to 0.6m for stronger winds. 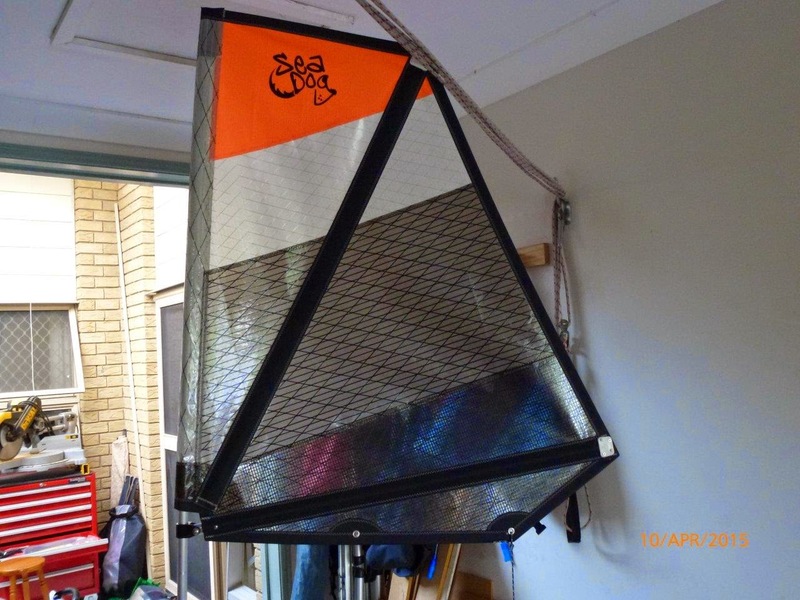 Sails $330 or $345 AUD with reefing eyelets. Contact Richard quoting Code No. and shipping address to order. The stock list will be updated weekly. 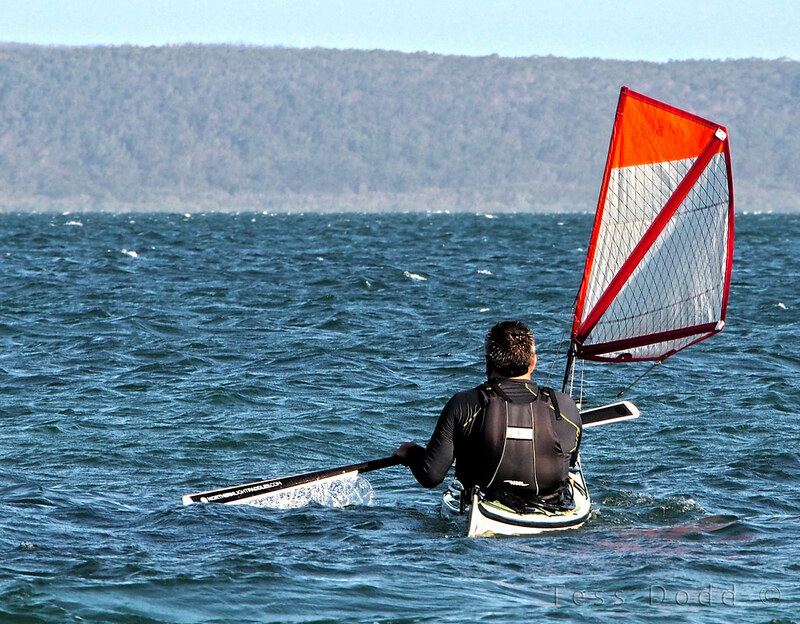 Sails shipped Australia wide or Internationally. Request shipping quote. Commander 0.8 Code 968 Red and yellow are most highly visible colours on the water. 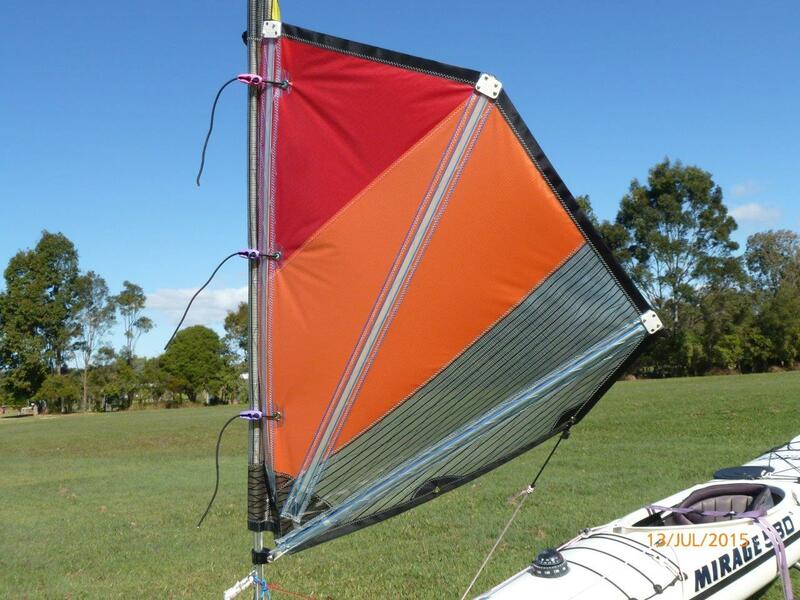 This sail is made from Maxilite 250 a heavier version of cloth to what is normally supplied. 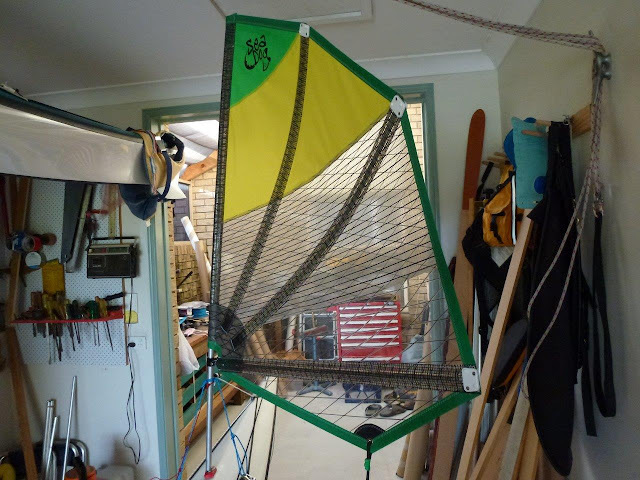 Particularly suitable for those wanting a tough heavy duty sail for expedition, as well as general use. 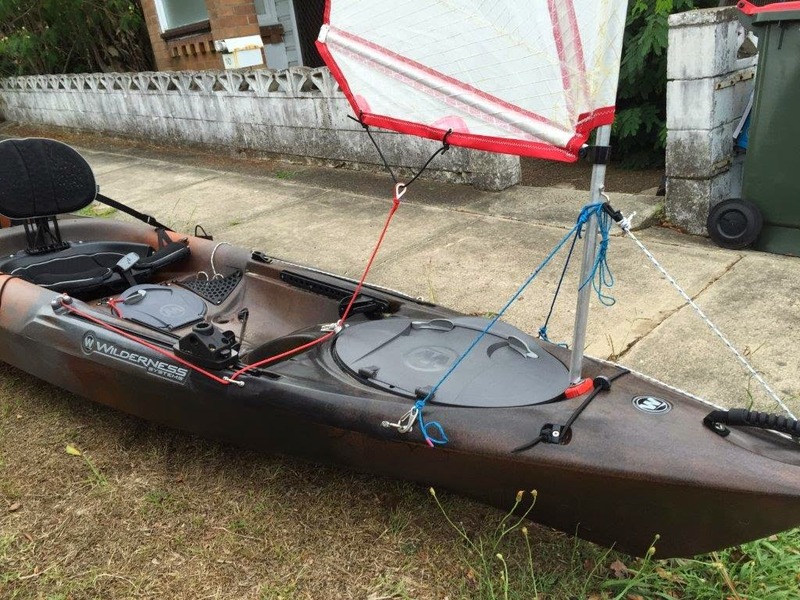 SeaDog Kayak Sails are the bomb and will make your sea kayaking way more fun than just paddling. 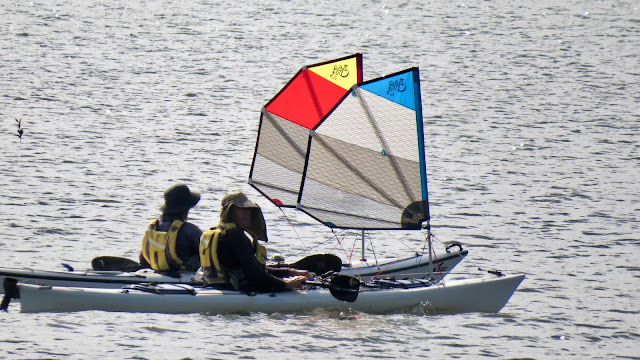 Sailing with a kayak sail in a sea or Sit on Top kayak is easy. 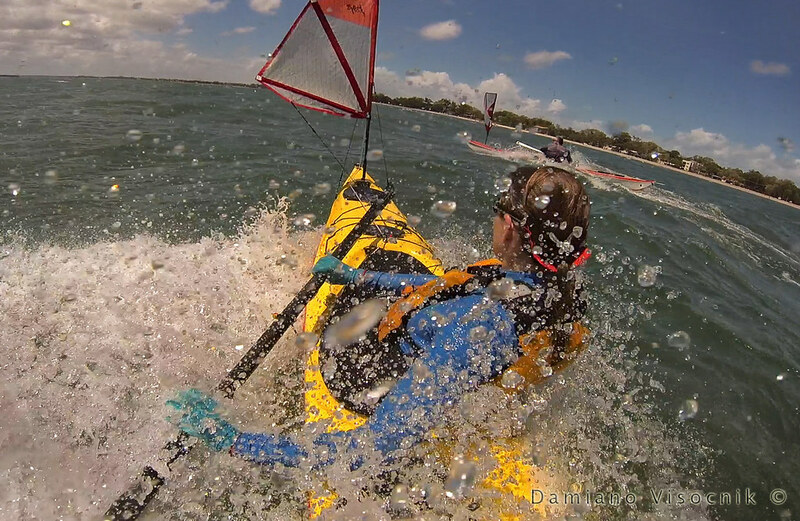 How often have you been out on the water in your kayak and there was a bit of breeze blowing? Have you ever wished to be able to harness the wind and get to help you along? 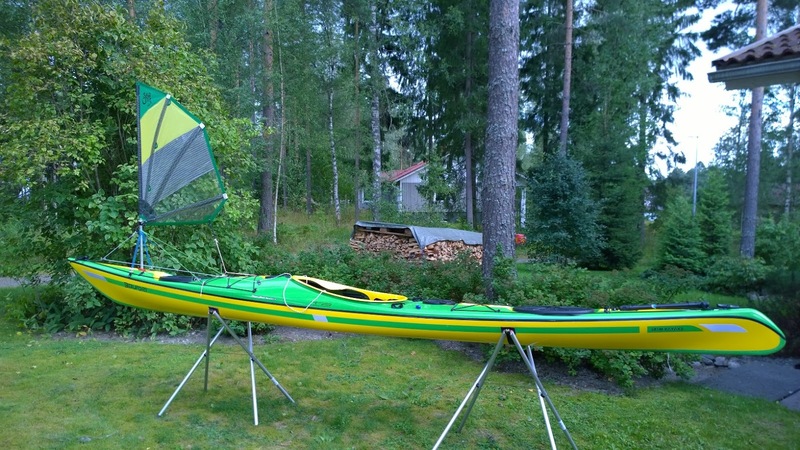 Now you can with a Sea Kayak Sail! 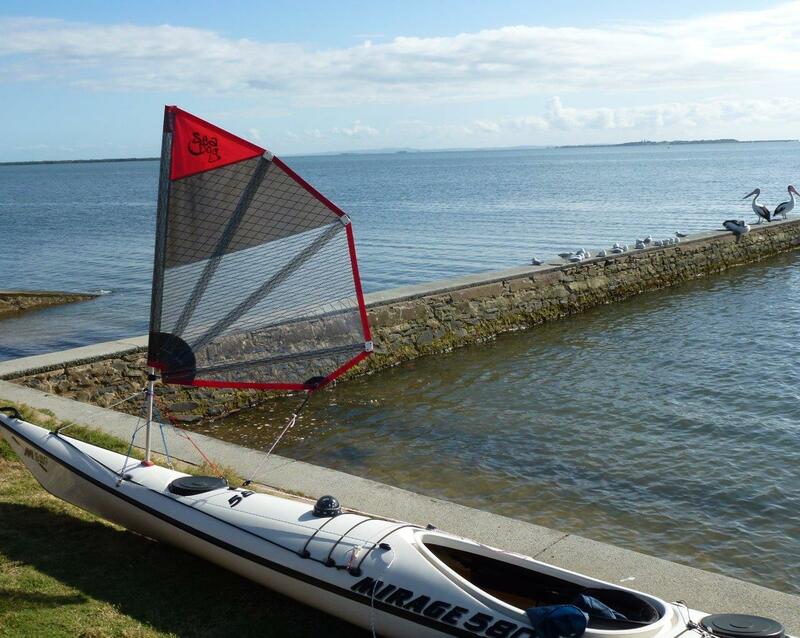 SeaDog kayak sails are extremely efficient and unlike some other sails they offer upwind* sailing in a kayak. Yes, one can sail across the wind and go out and back without having to paddle at all, if so wishing. The kayak sails are mounted far away enough that the kayaker can still paddle freely unrestricted for when the winds are too light to sail alone. 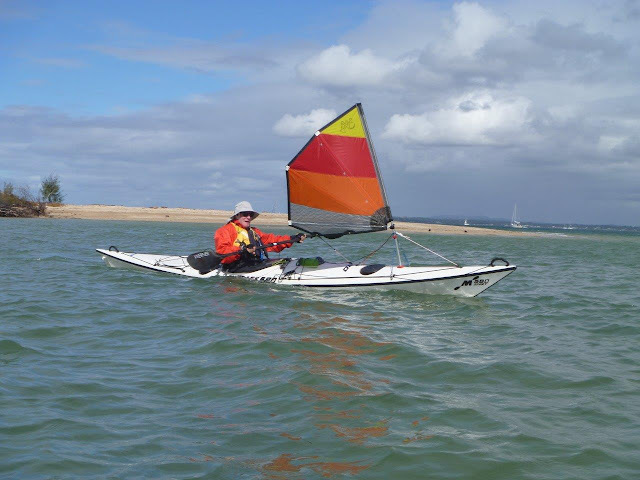 A SeaDog kayak sail with a bit of breeze and the paddling suddenly becomes so much easier. When the wind picks up one can just sail and if the wind is too strong for a novice, the sail can be lowered in a split second. SeaDog Commander Mk2 in full flight off Coochiemudlow in 18knots. 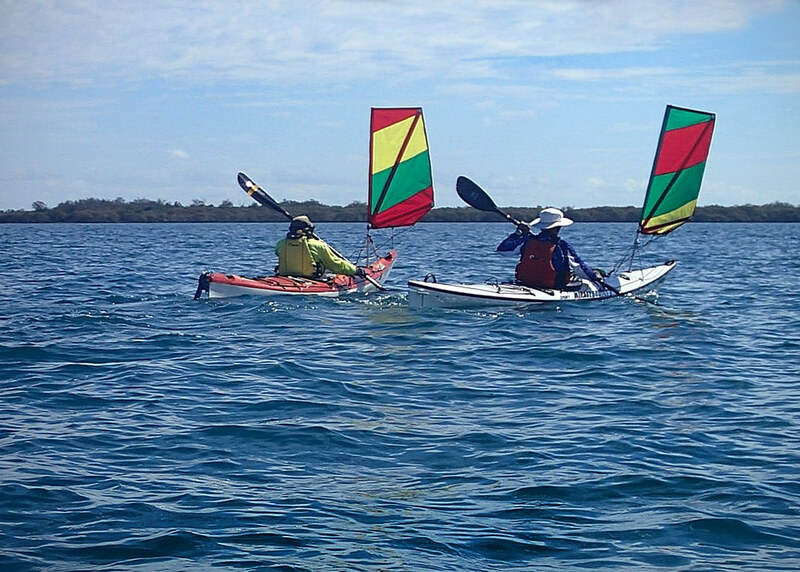 Kayak sailing is all about having fun and you will get this in droves with a SeaDog Commander. Commander with reefing Red top and Translucent bottom panel. 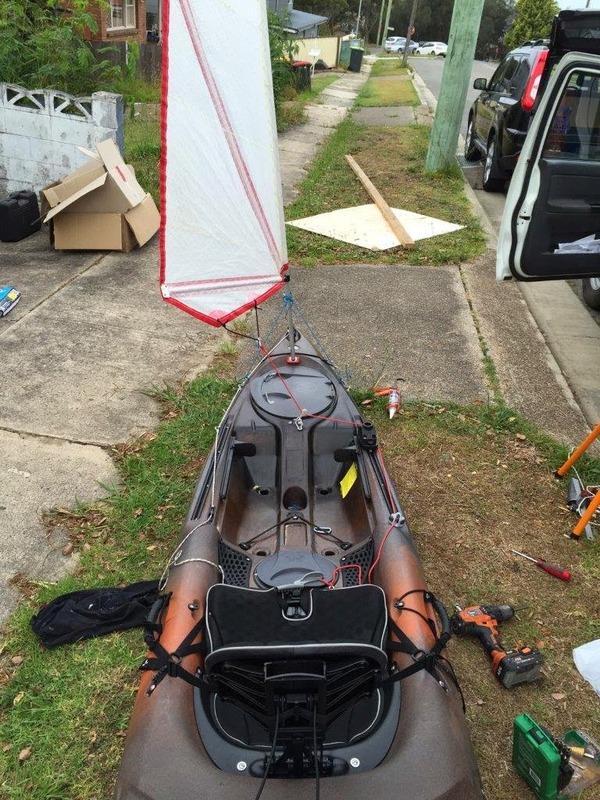 Most kayaks need very little modifications to install a SeaDog sail. 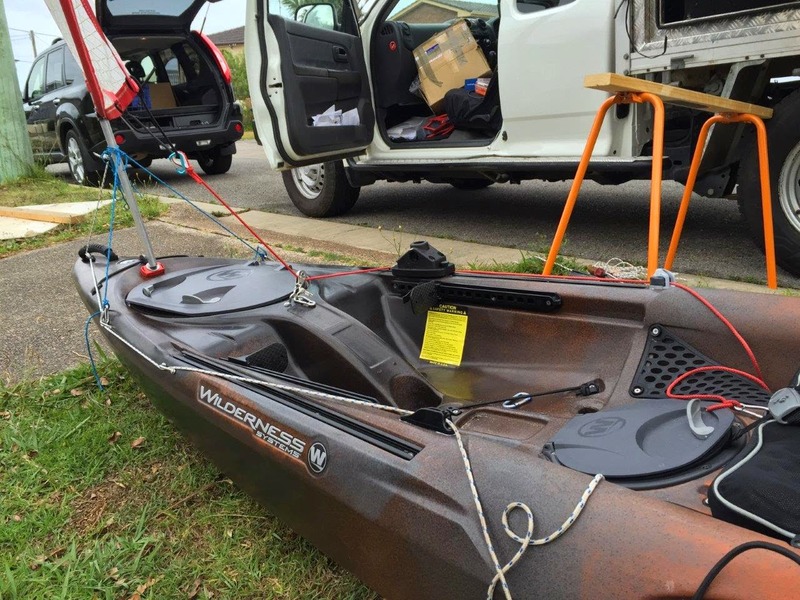 One has to be prepared to drill a couple of holes into the deck which will NOT compromise the integrity or waterpoofness of a kayak. SeaDog sails are based on a design developed decades ago and refined over time. 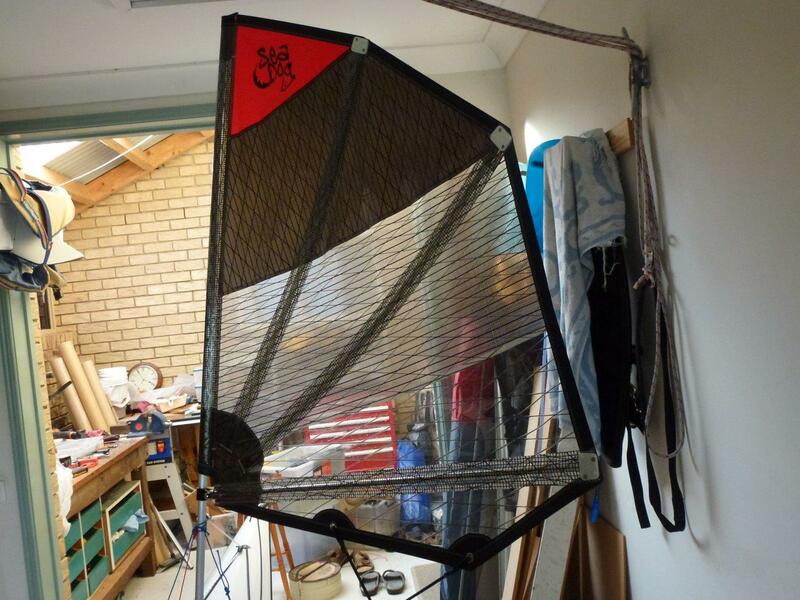 The materials used in SeaDog sails are premium not currently found in other sails on the market. The workmanship is superb and the design can be customized to personal requirements. 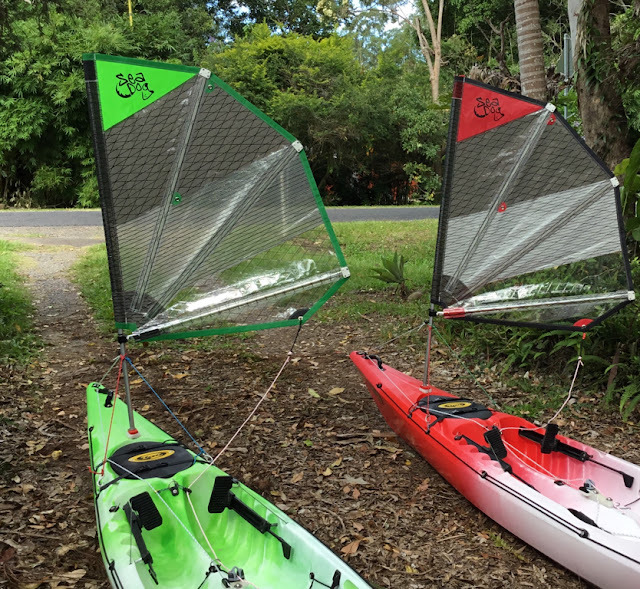 These sails are just as suitable for both SOT Fishing Kayaks as they are for sea kayaks. The workmanship and cut of the sails is top quality and cannot be faulted. 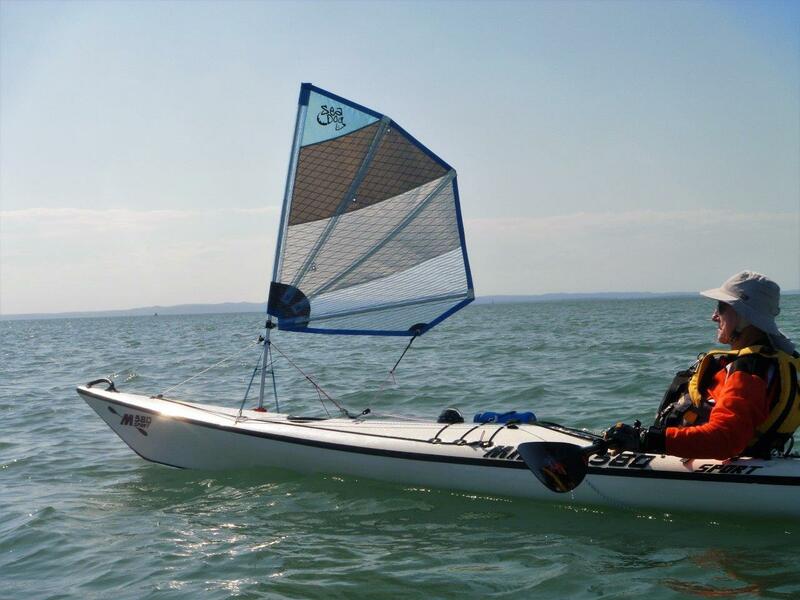 The sails are made up of a combination of panels using a mix of Contender Dark Grey Code Zero laminate with a black diamond reinforcing weave on a Mylar base, as well as other panels comprising Contender ZZ03 dark grey tri-laminate sailcloth reinforced with Black Aramid (similar to Kevlar) diamond patterns. This is the type of sailcloth used in racing dinghys. It is a very stable cloth and resists stretching in the leech which is the most common cause of leech flutter. Top panels are coloured so that the sails are highly visible on the water. 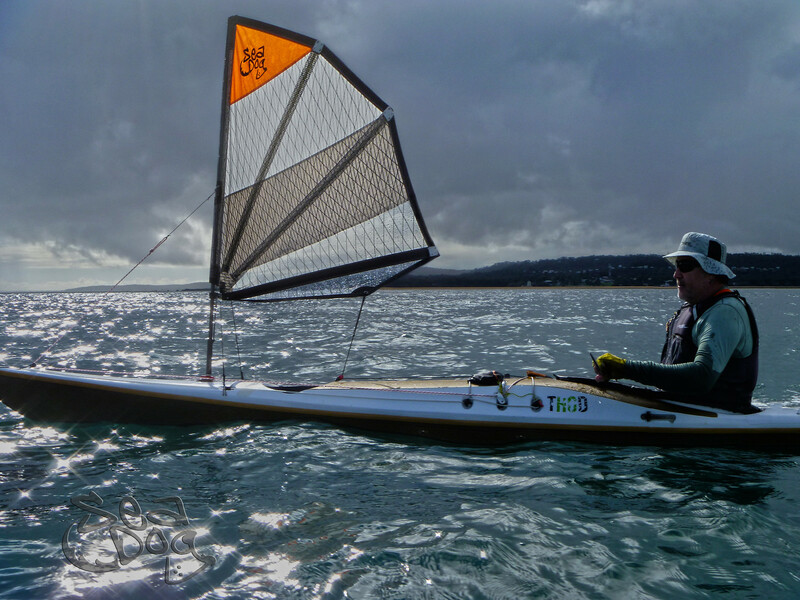 This mix of panels allows the sail to have an optimum aerodynamic shape, giving it the right characteristics for excellent upwind performance as well as off the wind. 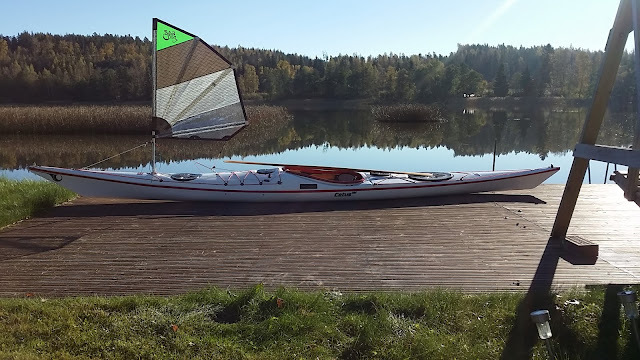 The stays are attached to the mast below the sail, making this type of sail particularly suited to kayaks, as should the paddler be hit by a strong gust of wind, the sheet rope can be released and the sail will fly forward of the mast, instantly depowering the sail. 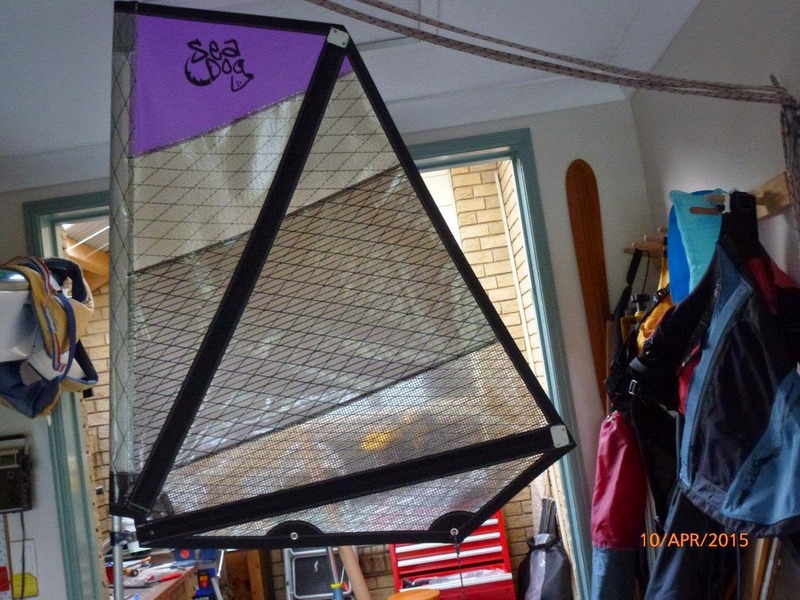 Sails come complete with mast, boom, batten and Spectra side stays. Flexible mast deck fitting included which slides into the base of the mast for easy fitting or removal from the deck. Cords for uphaul and sheet rope also supplied. Mast length is 146cm for 0.8 size sail, 140cm for the 0.7 size. Sails are sold with a generous sized sail bag included. 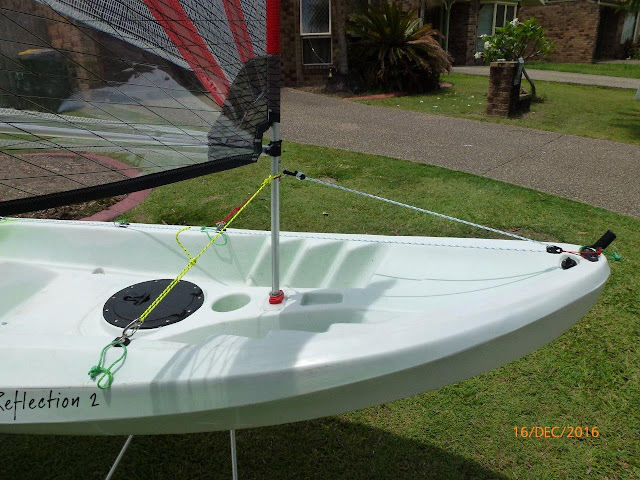 Deck fittings apart from flexible mast base not included as these are an individual choice. 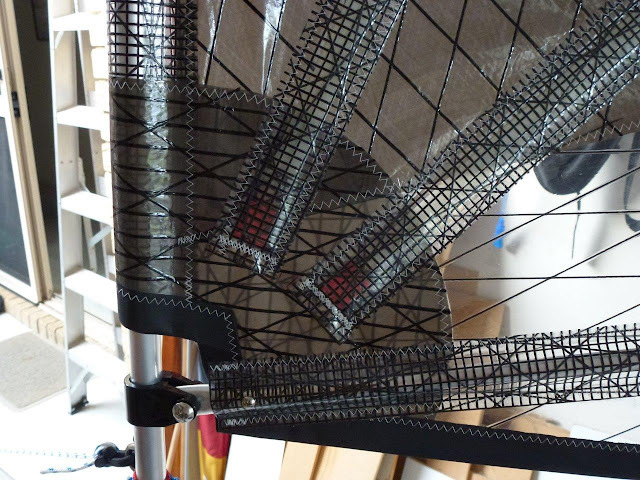 These Black Diamond sails are available in sizes of 0.8m² and 0.7m². For sailors wanting to venture in stiffer breezes I make a special 0.6m² sail in all coloured sailcloth. I usually stock 0.8m² and 0.7m² for immediate delivery, viewable on the next page below. Custom colours take approximately 2 weeks to manufacture. Local pick-up in Brisbane or request a quote for courier delivery anywhere in Australia. Request quote for International delivery stating Country, Town and Postcode. 1.0m Commander twin batten with loose foot and reefing eyelets. Contact Richard at seadogsails1@gmail.com for further information. 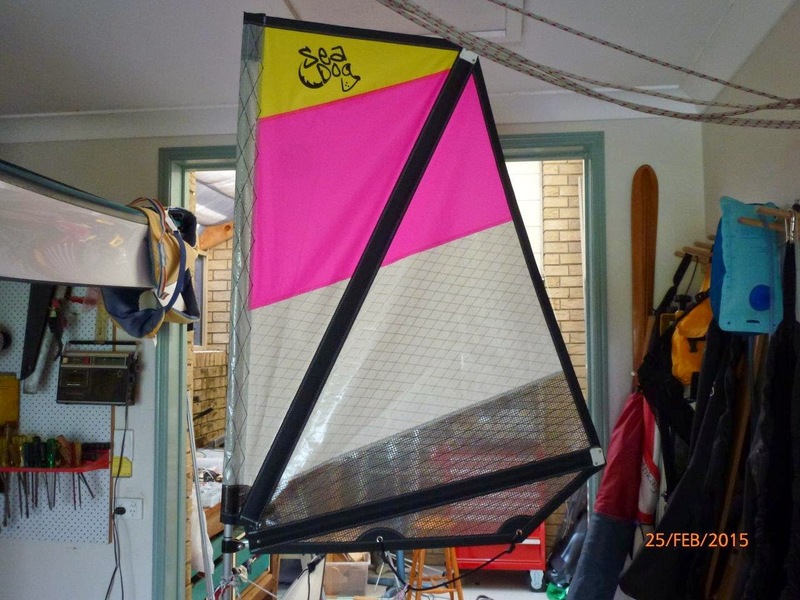 The SeaDog Commander Clear View is the latest sail from the SeaDog range of sails which include the Multi-coloured sails made of nylon Spinnaker cloth, the Black Diamond series and now the Commander Clear-View with twin battens. The Black Diamond series are now also available with the Clear-View bottom panel. The use of hi tech sailcloth combined with the high quality workmanship and the twin batten design of the Commander as well as the great value for money places these sails ahead of any competition. The mast boom and battens to fold together as one neat package when stowed on the deck. 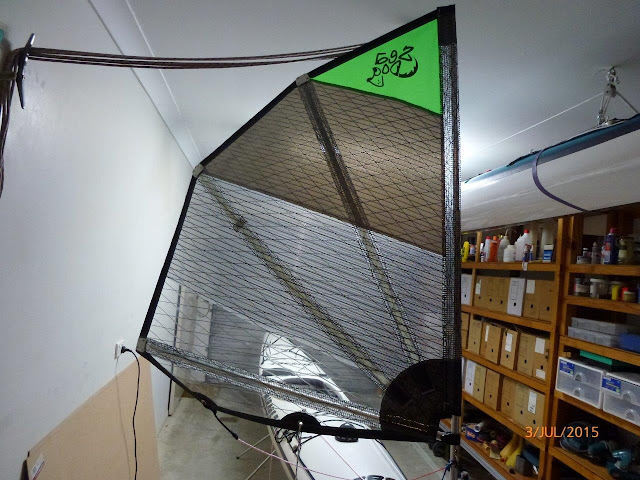 Twin battens to improve the aerodynamic shape in all wind strengths. Reduce the likelihood of “motoring” when the leech flutters due to stretch of the sailcloth. Clear-View bottom panel for exceptional forward visibility. Hi tech sail fabric combined with a coloured top panel for great visibility on the water. Examples of the Commander are pictured below. 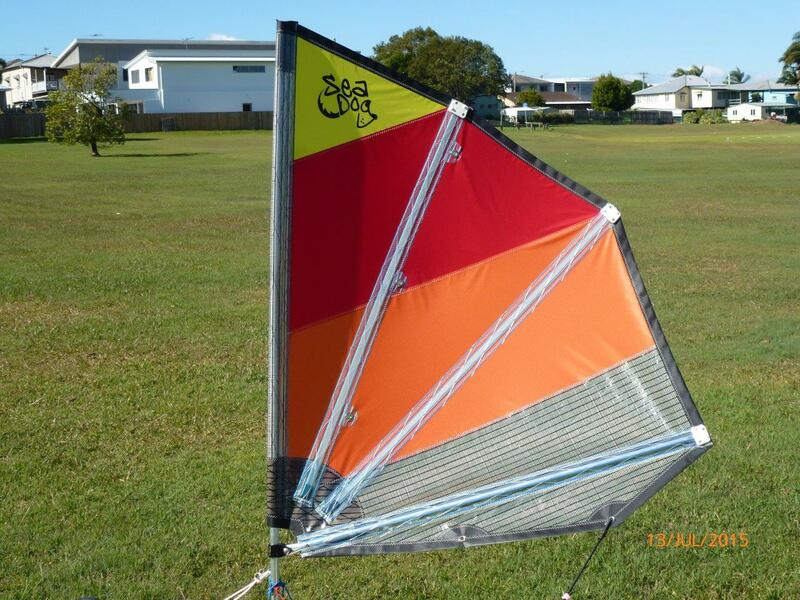 These sails are available for immediate delivery or if out of stock can be made within a week. Sails have been shipped worldwide including USA, Canada, UK, Finland, Denmark, Sweden, Germany and West Indies. 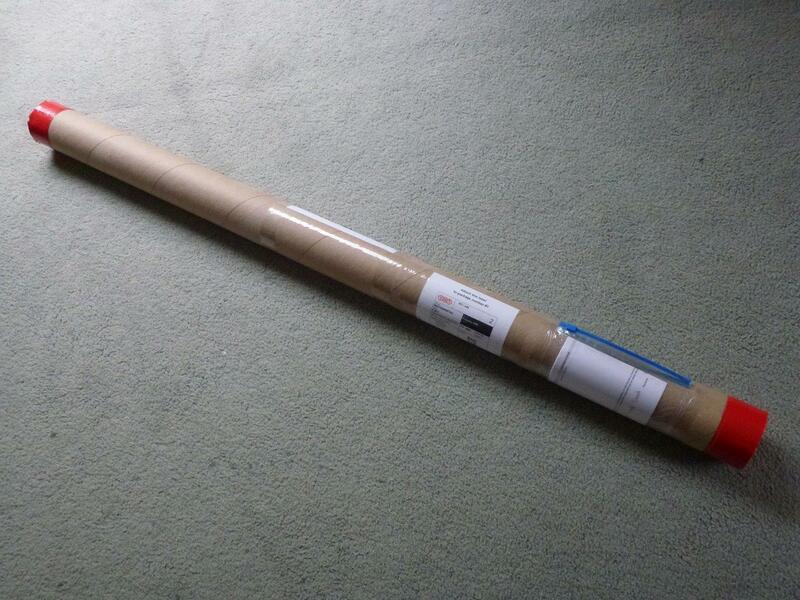 For a quote on international shipping, please send me Country, Town and Postcode. With the Australian dollar historically low, the price of my sails offers exceptional value. One sail to cover a wind range of 5 - 25 knots. Mirage 582 with matching custom colours. 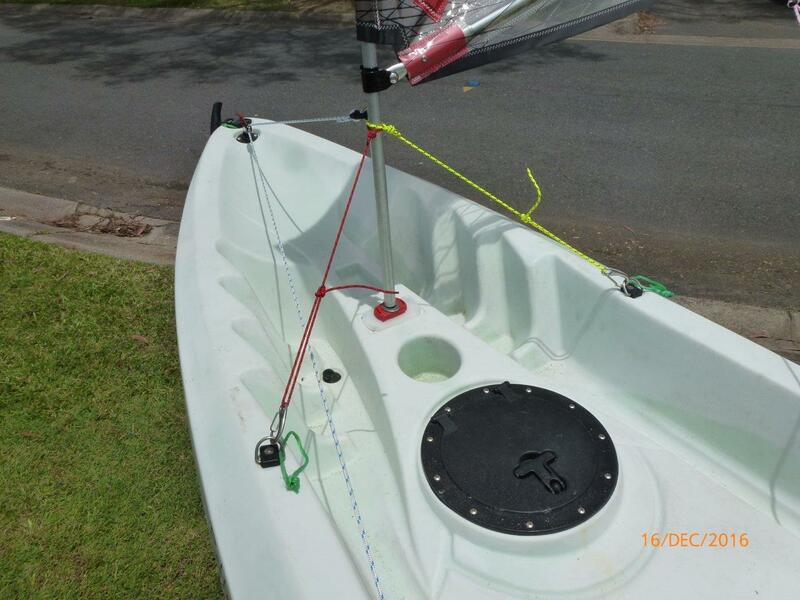 Custom colours to match your boat on request at no extra charge. 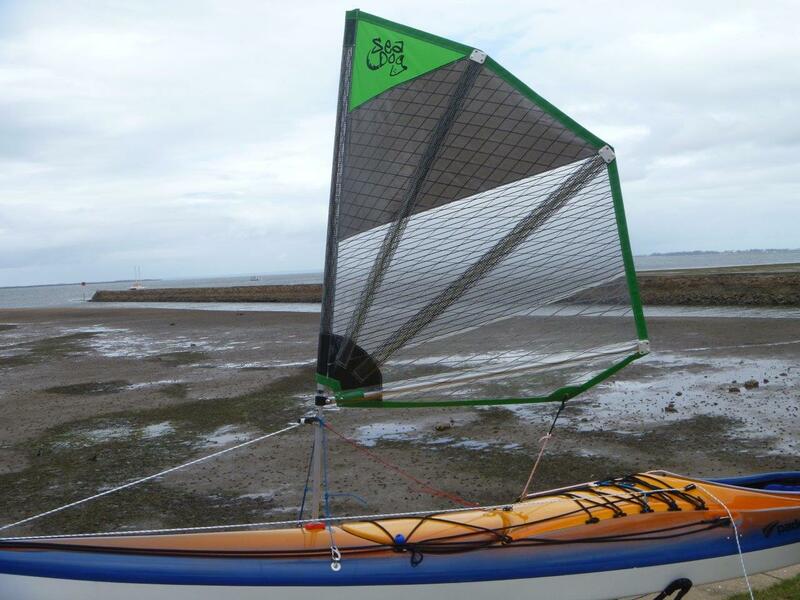 Custom sails with varying coloured top 2 panels, available from the above range of sailcloth. A special limited edition of the SeaDog Commander. This sail will ensure that you stand out in the crowd, and with its colourful panels is quite unique in its appearance. The sail comes complete with reefing points, twin battens and translucent bottom panel. Detail of the high quality workmanship in every SeaDog Commander sail. Dark grey Contender sailcloth with diamond black aramid reinforcing with white Code Zero panel. Orange top panel, white Code Zero, dark grey Contender cloth. Purple top panel, Contender grey cloth with black aramid reinforcing panels. Yellow top, Pink, White Code Zero, Contender ZZ03 bottom panel. The Black Diamond Clear-ViewTM utilises a clear see-through Mylar cloth with a black Aramid diamond pattern on the bottom panel. The see-through panel allows excellent visibility while still maintaining a fully aerodynamic shape to the sail. The Mylar is shiny on both sides and is crinkly to the touch. 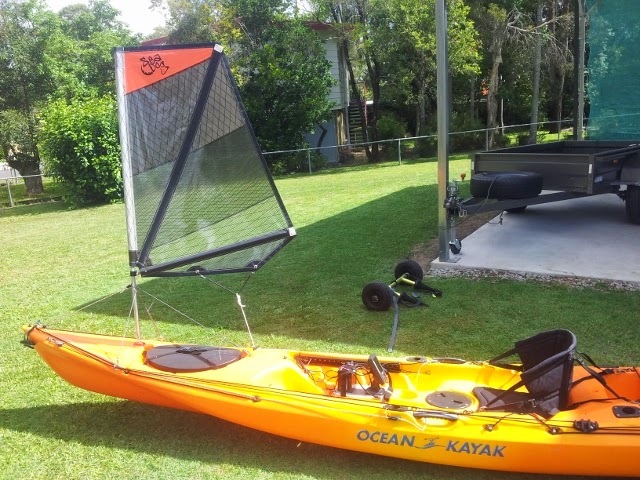 This may suit the kayaker who wants visibility through the sail and would otherwise have requested a separate vinyl panel sewn into the sail. Having the entire bottom panel as see through allows vastly better visibility than a vinyl window, which historically has been the only option. Orange top panel giving excellent visibility on the water. Dark and light grey Contender sailcloth with black Aramid reinforcing. Clear-View Aramid reinforced bottom panel to give excellent vision ahead. 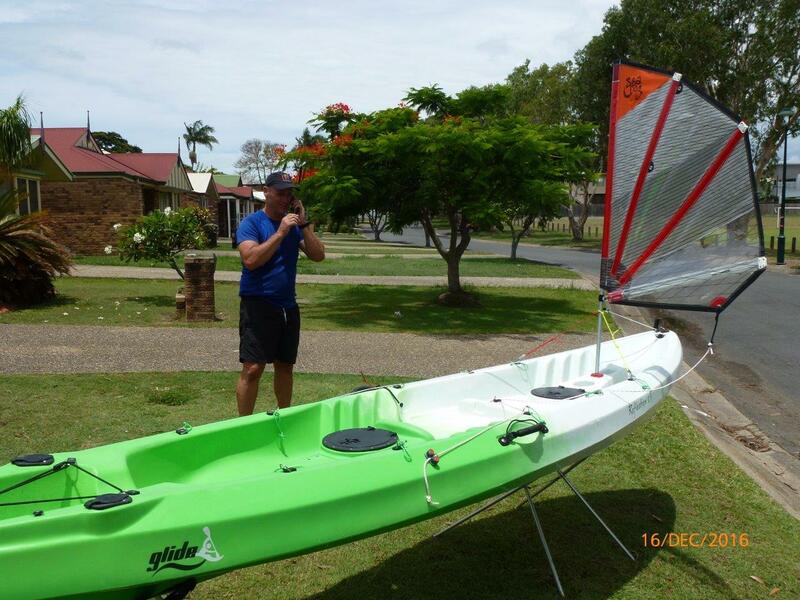 If you have a SOT fishing kayak, why not take advantage of the wind to take you to your chosen spot. 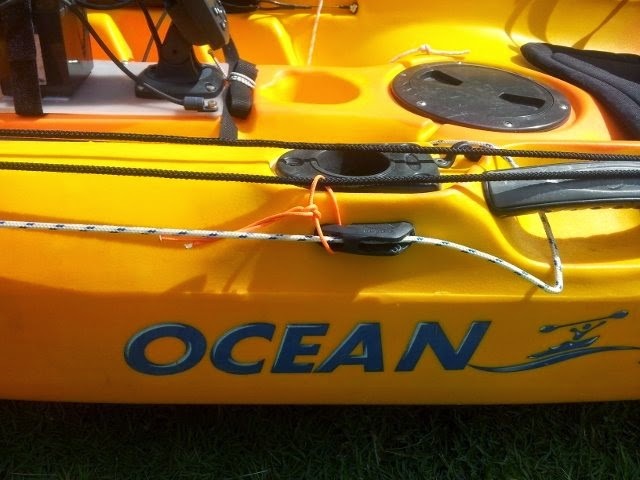 While SOTs won't point as high to the wind as a Sea Kayak they will have a significant improvement in speed on a reach (with the wind abeam) or aft (with the wind coming from behind). The recommended sail size for a SOT is 0.8m as these boats are significantly heavier than a Sea Kayak and much wider and therefore more stable. 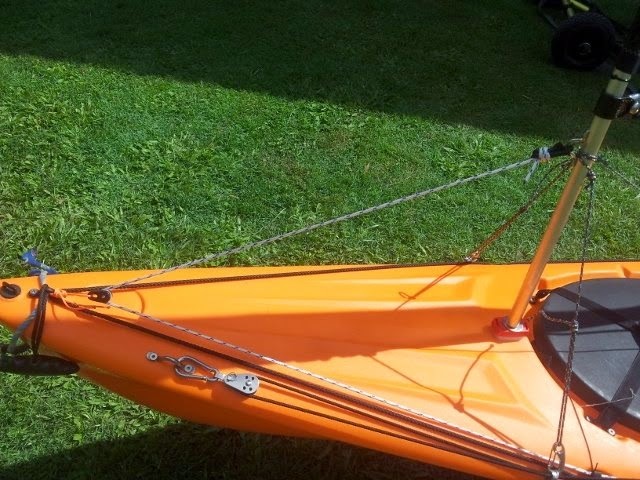 The mast can be mounted as either a 3 stay system utilising 2 sidestays and a backstay or 2 stays as in the picture above. Fitout showing mounting points for mast base and side stays attachment. The uphaul and sheet ropes are run along the gunwhale either side of the cockpit and out of the way of the rudder pedals. Uphaul cord (for raising and lowering the sail) leading into a clam cleat. Uphaul cord leading through a small pulley attached to the bow of the boat and then back to the clam cleat as shown above. All the fittings necessary to mount the sail are readily available from any marine supplier or ships chandlery. The red flexible mast base as seen in the picture above is supplied with the sail, as are all cords and stays.